With population health sciences becoming a larger and more important field in medical research, the UNYTE Translational Research Network will host a scientific session on Dec. 3 in the hopes of bringing together population health researchers, clinical leaders, community members and data scientists. The session, from 10:30 a.m. to 3:30 p.m. in Helen Wood Hall Auditorium (1W304) will explore what population health research brings to the clinical enterprise and vice versa. Participants will explore innovative methods and recent successes in population health research, and will learn more about community and patient priorities for population health improvements. View detailed event information, including a call for poster abstracts. Registration deadline is Nov. 19; for more information, email UNYTE@urmc.rochester.edu. With his extensive education and varied work history, you could say David Pinto is a modern Renaissance man. Now, he has found a place that marries nicely his various strengths. He has a degree in finance from the University of Buffalo and worked in banking and finance for several years before becoming a project manager in the construction industry. During his time working in construction he earned a music degree in performance and is an accomplished bass guitar recording artist. He then earned his degree in nursing from the University of Rochester, School of Nursing and worked at Strong Hospital in the Cardiovascular Intensive Care unit, after which he became a study coordinator in heart research. His experience in project management and as a study coordinator in cardiology made him an ideal candidate for his current position as a Clinical Research Informaticist. Pinto manages all CTSI research requests for the i2b2 tool as well as data extraction requests from eRecord, Flowcast, HBOC, Softlab, Trendstar, and others. 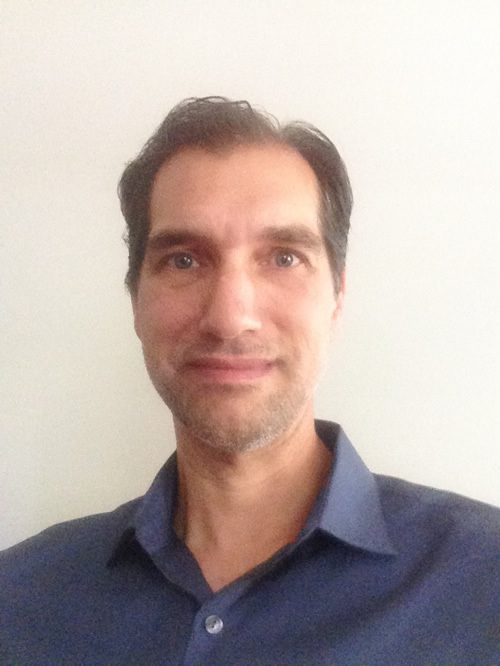 He also spends part of his time providing data management support for the Rochester Center for Health Informatics. 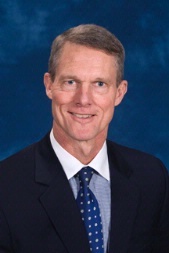 “David is a great choice for this position because of his experience as a clinician (nurse), his experience as a research coordinator, his organizational skills, reputation for thoroughness, and his willingness to learn new things,” said Tom Fogg, CTSI Director of Operations. When he is not working, Pinto is very busy spending time with his three daughters, a nine-year-old and twin seven-year-olds. His real passion is playing bass guitar in many genres but his recording artist efforts are in jazz music with the group Hard Logic. He can be seen performing around the city including at the Rochester International Jazz Festival. Pinto’s office is located on the 4th floor of the Saunders Research Building; stop by and say hello. Coming soon to a waiting room near you! In the hopes of generating more interest in research participation, the CTSI has obtained a mobile ResearchMatch kiosk, which will be popping up in a handful of patient waiting rooms in the coming months. Starting Monday, Oct. 26, you’ll find this kiosk in the Sonia & Murray Morgan Family Waiting Room (#1-1230) located near the Friends of Strong office. Later this year, you might see it in Miner Library or in the Golisano Children Hospital Family Resource Library. Research recruitment and retention is a goal of the CTSI’s Research Help Desk, and the kiosk should generate some interest from patients. ResearchMatch is a free, national recruitment registry that brings together researchers and people who are interested to learn more about research studies via a secure website. How does ResearchMatch benefit volunteers? Searching for clinical studies to join can be time consuming. ResearchMatch makes this process easier for people who want to become volunteers in studies taking place at the University of Rochester and across the country. Who can participate in ResearchMatch? Anyone living in the United States with a working email address can join ResearchMatch. A parent, legal guardian, or caretaker may register for someone under age 18 or for adults who cannot enter information themselves. Many studies look for healthy people of all ages, while some studies need people with specific health conditions. 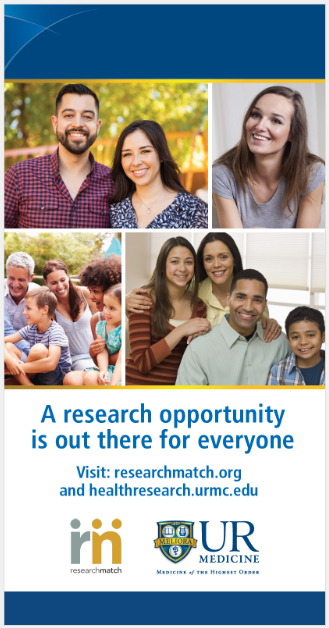 ResearchMatch helps match volunteers with any type of research study—from surveys (which do not involve treatment) to clinical trials (which may involve treatment). After you register, researchers who are authorized to use ResearchMatch can look at your profile—with your name and contact information omitted. If a researcher thinks your profile matches a study’s needs, you may receive an email message through ResearchMatch from that researcher. This message will tell you more information about the study. You may respond “Yes” if you want to learn more or “No” if not interested. A “Yes” response releases your contact information to the researcher, who may contact you directly with more information. A “No” response keeps your contact information hidden. Please remember that even if you respond “Yes” through ResearchMatch, you are never required to take part in a study. ResearchMatch helps you connect with the researcher. You decide if you want to participate. ResearchMatch will not sell, rent, or lease your personal information. What is the connection between the University of Rochester and ResearchMatch? ResearchMatch is a collaborative effort developed at Vanderbilt University through the Clinical and Translational Science Awards (CTSA) consortium, which is led by the National Center for Advancing Translational Sciences, part of the National Institutes of Health. The CTSA is a national network of over 60 medical research institutions working together to improve the way biomedical research is conducted across the country. The University of Rochester participates in ResearchMatch as an awarded site of the CTSA consortium. The University of Rochester is a participating organization with ResearchMatch. If you are a University of Rochester researcher with an approved IRB study, you can use ResearchMatch as one of your recruitment tools. Together we are helping to shape the future of health care. Learn more about using ResearchMatch. Eva Pressman, M.D., discusses her CTSI Pilot Project, Vitamin D Kinetics During Pregnancy. Dr. Pressman is The Henry A. Thiede Professor and Chair of The Department of Obstetrics and Gynecology at The University of Rochester. Video by Susanne Pritchard Pallo. Every month, the CTSI Stories Blog will post excerpts from ongoing conversations with the institute’s co-directors. This month, Karl Kieburtz looks back on the grant-writing process and discusses the advantages to including so many people. First, congratulations on being done! Thank you! Yes, we’re done, and we’ve submitted the CTSA renewal grant application to NCATS. This grant involved work from more than 50 people. Why did you feel it was important to include so many of us? I’m guessing that must have made it harder in some ways. Well, I’ll answer that by giving a little background first, because what we’re actually tasked with here in the CTSI is tricky. First, we’re an institute and we’re supposed to do certain things – we’re supposed to train people, help foster collaborations, get people moving in certain research directions, and so on. And we’re supposed to do that in an organized and structured fashion. At the same time, we’re supposed to innovate. Innovate is an easy thing to say, but innovation really requires discovery, and discovery is only possible, in my view, when you cease to be enamored with what you know. You can be standing next to someone, seeing the same thing they’re seeing, but they’re looking at it in a different way and so they make a discovery and you don’t. That’s why most innovation organizations are small. It’s a group of guys and gals off somewhere else, disconnected from a mainline organization, fiddling around. But that perspective – not being enthralled with the rules and trying to forget what we already know – is antithetical to being structured and delivering on things that we say we’re going to deliver on. So that puts us in a difficult position of needing to deliver in an organized way, while also needing to suspend some of the rules. So that’s tricky. We have an infrastructure grant to provide education, collaborative interaction, and funding, but it’s tough to innovate infrastructure. I think the only way you can do it is by involving a lot of people and embracing the perspectives of others. The easiest thing in the world to do is to write down everything you already know. The hardest thing is to listen to what everyone has to say and find a way to express the views of every person. The grant could have been written by a small handful of people just deciding what it is we should do. But, obviously, that’s not what we did. Did it pay off? Would you do it this way again? We came up with about a dozen innovative programs beyond what we’re doing now. And these programs weren’t prompted by the grant. They came from people talking to us – at the CTSI retreat, at the Town Hall meeting – about the new things we could try to do. Ultimately, the actual core text and references was about 190 pages, broken into 10 different sections. Each of those sections had two or three pieces, and each of those pieces had a team of four or five people working on it. That’s what gave us that varied perspective. If it was just Martin, Nana, and I sitting in a room, that never would have happened. It would have been easier, yes, but not as diverse. When do you expect to get an answer from NCATS as to whether the CTSI grant will be renewed? It should be in the next several months. Thanks to all the hard work we did, we think we’re in a good position. September 2015 – Martin Zand discusses the CTSI’s research subject engagement efforts. August 2015 – Nana Bennett talks about the renewal grant that the CTSI is pursuing. Lisa DeLouise, Ph.D., M.P.D., associate professor of Dermatology, has received two Pilot Grants from the CTSI, each of which helped to support a line of research that blossomed into much more. She shared her experiences with CTSI Stories. Thanks for taking the time to chat! Tell us a little about the Pilot Grants you’ve gotten through the CTSI. The first one I got was in 2007, and it was for nanoparticle skin research. I look at cosmetic products to see if they have efficacy and any unintended toxicity issues, and back in 2006, I got involved in the question of whether nanoparticles that are increasingly formulated into various topical cosmetic products have any of these side effects. In sunscreens, for example, there are ingredients that can have unintended biological consequences, so I was looking at a couple compounds used in sunscreens – titanium oxide and zinc oxide – which absorb UV light so your skin is protected. When these compounds were first used, they were approved by the FDA at the micron level – so, relatively speaking, the particles were too large to seep through skin. It seems like they might be more susceptible to being absorbed by skin. Yes, that was also a concern – whether they could go through the skin barrier. So that’s what really launched my interest in this field of nanotoxicology, and I got some funding from the CTSI Pilot Program to look at this in the early going. I was also questioning whether people with skin diseases – who tend to have defects in their skin barrier – could be more susceptible to penetration of these materials. So in collaboration with Lisa Beck, M.D., we made some of these comparisons. Well, much of the research is still ongoing, because thanks in part to the early data gathered from the CTSI from 2007-2008, I was able to get an R01 grant in 2011. So I’m in my fourth year of that. But we do know that nanoparticles go through the skin and more easily through barrier impaired skin. The titanium dioxide has the tendency to conglomerate on the skin surface, so it loses it’s nanomaterial status. The zinc oxide, though, does get into the body, though it’s still unclear whether it’s penetrating the skin as nanoparticle or in another form such as a dissociated ions. Very interesting. How about the second CTSI Pilot grant you received in 2011? In 2011, the CTSI supported an application of microarray technology that allowed us to sort and enrich rare cells in the blood. The award was critical to fostering a collaboration between myself and James Kobie, Ph.D. We haven’t landed the R01 yet – we’re still trying – but the big success story is that the application of the technology has proven very positive. In cancer, a lot of tumors are infiltrated with B-cells, which are antibody-making cells. So understanding the antibodies and other proteins secreted will help us understand the disease and why the B-cells are there sometimes and not there other times. Also, in cancer therapeutics, the field seems to be headed toward controlling the immune system and training it to fight the cancer in a more effective way. So with the microarray technology, we were able to prove that you could look specifically at these human B-cells and their secretions. Earlier this year, we started a company named Nidus Biosciences to explore the potential of this technology. The CTSI is what really kept us going with momentum in that crucial early stage.